Beautiful Casa Bella is located just four blocks from Parque Central in Antigua and only two blocks from the main artisans and food markets. The house sits in a gated/guarded community and is only 10 years old. The colonial style, lovely antiques and fun art work add to the charm of this unique house, which includes all the conveniences of home. The bedrooms open on to a covered patio and large rooftop patio. Enjoy the garden below, the potted plants & porch swing, while gazing at the magnificent and ever-changing sky around Volcan Agua to the south. This view is stunning! The two downstairs bedrooms have the same bed configurations as the two upstairs, except they each have their own bathrooms with walk-in showers. These bedrooms share access to a beautiful back garden and a lush central garden with a pila fountain. All bedding is 100% cotton. Each bed is provided with a light and fluffy natural down comforter. Garden and hanging plants surround the patios along with tasteful art and colonial antiques. The indoor-outdoor living is easy to get accustomed to, as the mild year round temperatures invite the visitor into the fresh sun shining air.There are cozy couches on the patio and table and chairs, making it easy to transition from indoors to outdoor living. The kitchen is fully equipped and has a small colonial dining table for four. There is a large dining room (seats eight) and living room with couches and seating designed for relaxation. The style is elegant, yet Casa Bella still has a down home comfort feel. It is imbued with an atmosphere of color, light, openness, and beauty. This is a truly wonderful house to escape to! The housekeeper cares for Casa Bella Monday-Friday: makes the beds, cleans the bathrooms and maintains the casa. Her devoted attention to the tile floors keeps them fresh and looking like works of art! The house is also child-friendly, with baby changing tables, baby gates, and high chairs. Two walk-in showers in the bathrooms off the two downstairs bedrooms. Full bath is shared for the upstairs bedrooms, shower and tub. The fourth bathroom is near the kitchen and for general use. Stunning view of the Agua volcano changes daily. House phone for local calls. All cotton sheets, each bed has a medium weight down comforter and two pillows per person. Extra blankets (all cotton) are provided for cooler seasons. All 100% cotton towels are provided. American brand Tide soap is used. Also Dial soap is provided in pump bottles in all bathrooms and kitchen. All pots and pans, coffee maker and grinder, plates and utensils, serving dishes for parties and linens to make a festive event. Kitchen table seats four. Dining room table seats eight. Other tables to eat at in upstairs and downstairs corridor. Each bedroom has cable TV. The living room has HD cable TV (40 inch screen) and a DVD player. DVD Library with current movies and TV shows. It is easy to find current movies at a cheap cost in the mercado. Garden is quite pretty and something is always in bloom. The upstairs covered deck has a wonderful sitting area along with a long porch swing. It's a great place to drink a tea and take a nap. The view is of colonial roof tops going back into a beautiful mountain landscape. The large patio has a sturdy porch swing and benches to sit on to enjoy the awesome view of Volcan Agua. This view never gets boring as it is constantly changing with sky, clouds and weather. Breathtaking. Can help arrange transportation from airport to house if desired. Bose Ipod player, Filtered water system provided at the kitchen sink, Hairdryers provided, Massage table provided, Book library, Games, Spanish teacher referrals to come to the house, Salsa teacher referrals to come to the house, Housekeeper comes daily to clean and tidy, days can be limited or increased according to renter. We are frequent Guatemala visitors with two small children. We typically stay for months at a time. In the years we’ve been coming to Antigua this has, by far, been the most beautiful home with an excellent experience to match! Thank you- we will be back! We spent a week in this house. It is in a great location, in walking distance to central square and all the sites. It is also near both the amazing marketplace and a supermarket for convenience. The house is as beautiful as the posted pictures and it was kept sparking clean. The open courtyard with beautiful gardens allows access to the outdoors while maintaining privacy. We really appreciated the large and very functional kitchen because we bought fresh vegetables and meat at the marketplace and cooked most of our meals. The assortment of fruits and vegetables grown locally is just amazing. Robin provided a great guide and information for the house and the local sites and restaurants. (We loved Hector's!). Spent a day at the Santa Teresita Spa with thermal pools and massages - also highly recommended! We felt very safe in the gated community and actually throughout the entire city. This rental exceeded our expectations! There is truly no way we could express in 2500 characters our satisfaction with Robin’s home and hospitality. Our family of nine enjoyed three full months in Antigua and Robin’s house was a perfect refuge after traveling, language school and adventuring throughout Guatemala. Bedrooms: We all slept very comfortably in the four beautifully decorated bedrooms. The beds were very comfortable and clean. The screens on the windows and doors made for a very comfortable climate in each room. There was ample closet space as well. Bathrooms: Hot water! Beautiful showers and even a soaking tub in the upstairs shared bathroom. Wonderful tile throughout. Kitchen: Every appliance and kitchen utensil you could ever want or need. We had so much fun cooking each day and eating breakfast at the small kitchen breakfast table. The dining room was perfect for our large family and even additional people for a thanksgiving feast. Outdoors: The gardens and the terrazas were absolutely breathtaking, perfect for morning coffee and reading. Views of the volcanoes and the surrounding hills were ideal for contemplation and relaxation. Staff: Virginia and Carlos were the added bonus for out time in Antigua. Their attention to service and constant smiles made us feel comfortable and welcome. They not only helped keep the house in order, they had great advice for us to enjoy every moment of our time there. They embodied Guatemalan hospitality. The neighborhood: During our stay, we never felt unsafe or in danger. The neighborhood is guarded 24 hours a day. The men at the gate were always friendly and protective of our children. We witnessed on a few occasions visitors stopped at the gate before getting clearance to enter. The grounds were well maintained and the neighbors were friendly. Overall, this house is something out of a dream. You will not be disappointed. It is better than the pictures even show. Robin is the best owner that we have ever interacted with on VRBO. Look no further for your Antigua vacation home! 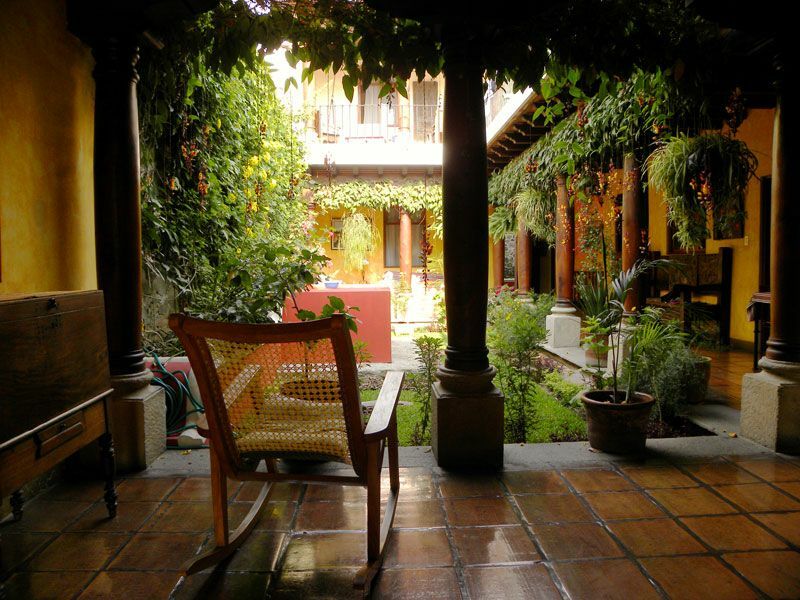 Robin's home is the perfect place to stay to enjoy all that Antigua and Guatemala have to offer. Inside and out, it is comfortable, inviting, clean, well-appointed, and safe. Her staff is amazing and helpful. Everything about this house exceeded our expectations and we cannot wait to go back. a beautiful house that puts a premium on comfort. the art is fantastic! robin was a great hostess, attentive and thoughtful. We spent a great three months staying in the house. Comfortable and well situated. We will definitely rent this house again. La Reunion Golf Course is a 20 minute drive from Antigua. It is one of the most beautiful (and challenging) golf courses in the world.